I have a garage sale this weekend and was needing to figure out some way to be able to keep my cash at hand. The idea of a cashbox seemed a little cumbersome, so I came up with the idea of making myself an apron. 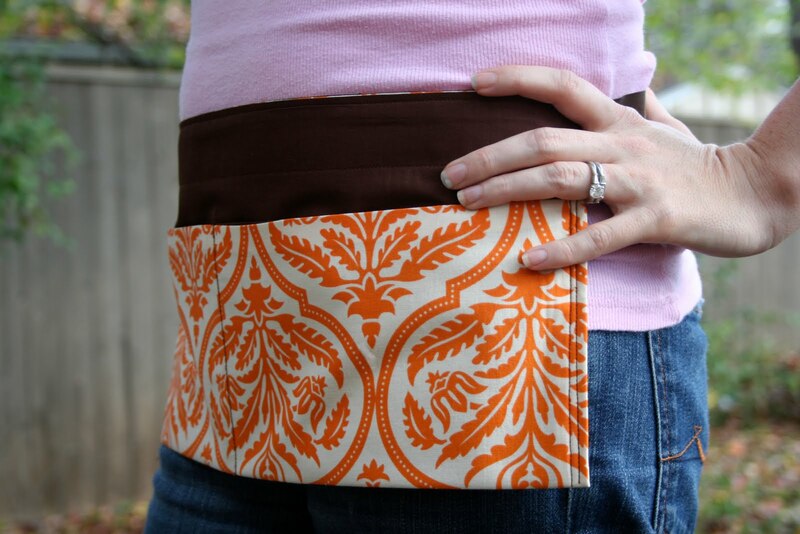 I modeled it after the Home Depot tool aprons (I've since learned some call these a vendor apron or a craft apron). I think it would be perfect for any time you need to carry stuff with you but need your hands free (which, for me is just about all the time really). Sewing machine, 2 coordinating fabrics, 2 yds ribbon, ruler, and your other standard sewing equipment (could you do this without a machine? Sure, just use a fabric bonder like Stitch Witchery). With the fabrics facing each other stitch around the 4 edges of the fabric. Make sure to leave an opening at the top so you have a way to flip the fabric right side out. Trim off the corners close to the stitching before turning the fabric right side out (this will make your corners turn better). Iron the fabric pieces, taking time to press the edges well. After this step you can stitch your opening closed, or leave it open (as I'll explain in the next step). Fold the fabric up about 3/4 of the way - I made sure to use the piece with the opening as the top of my pocket so I could use that as a place to put pens. This is my helper, Katbird, making sure to overpin my fabrics! Stitch the edges down - I did a double stitch just to reinforce the edge. After your sides are stitched, fold the apron in half and mark it with a disappearing pen or piece of chalk. Just stitch on the line you just created - this will divide your one large pocket into two. Pin 2 yards of ribbon to the top of the backside of the apron and stitch (or glue) it down. I cut my ends at an angle and then singed them with a match to prevent fraying. That's it! Easy as pie. Really. These instructions are for simply a basic apron - make yours your own by adding more smaller pockets. You could also add a loop using ribbon to hold a pair of scissors if you wanted.